So begins the second half of the CraftBeer advent calendar. The first half of it was rather good. As a recap on the countries we have visited so far we have: Norway, Finland, England, United States, Italy, Australia, New Zealand, Germany, Mexico, Iceland, Brazil, and the United States. So, thus far we have visited 11 unique countries on 4 different continents! Today’s beer takes us back to the United Kingdom, this time to Perth in Scotland! Perth is located to the north of Edinburgh, 42.8 miles away and within the city we will find the brewery who has made us our beer today - the Inveralmond Brewery. Founded in 1997, this brewery has certainly made a name for itself in Scotland. The head brewer, Ken, officially joined the brewery in 1999. A year later he smuggled some yeast to Scotland from the Czech Republic giving the brewery the claim of having the only “official” Czech Pilsner in Scotland. In 2002, they won Champion Beer of Scotland, no easy task, and continued to grow from that point on. In 2009 they had grown too big for their original space and laid the ground work to build their brand new brewery. They moved into the new brewery in 2011 and have continued to expand their production from brewing 8000 pints at a time to now brewing over 32000 pints at any given time. When their local team, St. Johnstone, made it to the Scottish cup for the first time in 130 years, they brewed a special blue beer to show their support. They are truly a Scottish brewery through and through. 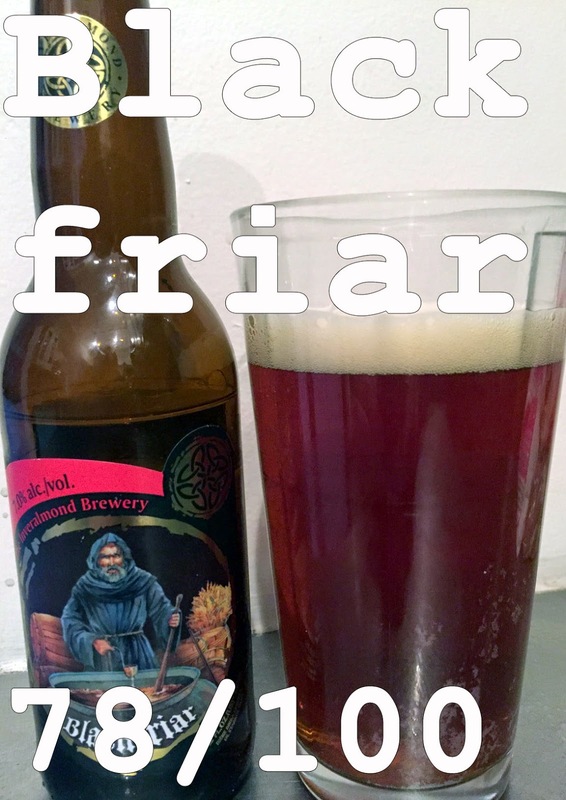 The beer we have the pleasure of tasting from them today is their Blackfriar Scotch Ale. It's named for one of the three ancient orders of monks who are central to the history of Perth. The monastery of the Blackfriar was built in 1231 and was the location of the assassination of King James I by traitors. Scotch Ales are strong ales which are traditionally known as a “wee heavy” in Scotland. Scotch ales are typically very malty and balanced with hops to land somewhere in the middle ground between sweet and bitter. This particular beer has been brewed with not only barley malts but also wheat which will give it a heavier, creamier feel. Balancing with four different kinds of hops this brew promises to have a number of flavor notes and I’m excited to see what it tastes like. Appearance: Copper brown beer, clear, 1” of head that retains well. Smell: Chocolate notes as well as the floral notes of hops. Smells a bit of caramel as well at the very end. Taste: Malts come through at the beginning with a creaminess that comes from the wheat malt. Balances really well with the hops providing a mild bitterness to combat the sweetness of the malts. Flavours of chocolate come through from the chocolate malt used in the beer. Overall: Creaminess is really pleasant and goes well with the richness of the malts and the balance of the hops. This beer has flavours that work well together with the specific body of it and I really found that I was enjoying the beer while drinking it. The use of wheat and barley malts was really smart and added a lot of character to the beer. Do I like it: I’m not a huge fan of this style of beer. While I wouldn’t necessarily seek this one out at the liquor store, I did enjoy it and would be happy to drink it given another opportunity. I feel the hops came through really well to balance the sweetness. Overall, a beer I really enjoyed.